TransportiCA: Happy Trails (via rail) to Hubert Hanrahan, CCJPA! Happy Trails (via rail) to Hubert Hanrahan, CCJPA! After six years as Capitol Corridor's Transportation Officer, five years with ACE, and 31 years with Amtrak, overall, Hubert Hanrahan's final alightment takes place next Friday, 07 October. This is not fair, and is very selfish of Hubert. Having an editorial staff of former local, state and federal public servants, we are well-aware of the "expectations" some have with government employees; do not ask too much of them, speak slowly, no brightly-colored clothing when approaching them, scream when they begin to say "let me transfer you," etc. 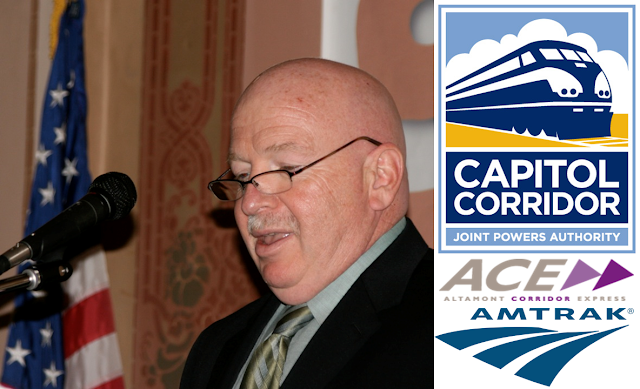 Hubert has been with CCJPA since the beginning, as he was a conductor on the inaugural Capitol Corridor train on 12 December 1991. Regardless, TransportiCA thanks Hubert for his unwavering and relentless service to the people, and hopes his successor has at least 1/4 of his talent. Greg Justice, Brian C. Swanson and Remi Mateo.